We all want to make sure our pampered pets are being well looked after. Cats have high expectations and certain standards, they demand the very best care from their owners – and who can blame them? Who wants to lounge in a dirty home, eat sub-standard food and play with a chewed-up piece of string? Not kitty, he has other ideas – a cosy bed, interactive toys, plenty of fresh water and cat food on par with the haute-cuisine served in the best restaurants. We think your puss will be suitably impressed with the food produced by Orijen – A Canadian pet food company with over twenty-five years of experience in the field. Orijen have a clear mission – to make biologically appropriate pet foods from fresh, regional ingredients. The recipes contains dried meats that are prepared especially – fresh meat is dried at 200 degrees Fahrenheit and this provides a really rich source of protein. It’s essential that puss follows a healthy and balanced diet, enjoying food that will help him to thrive and get all the nutrients and vitamins required for good health and well-being. Let’s check out five of their best-selling products from Orijen. Orijen Cat & Kitten Cat Food is based upon the school of thought that cats and kittens have an inbuilt need for food that is rich in protein. 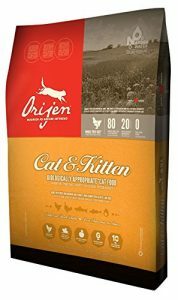 Orijen Cat & Kitten Food doesn’t disappoint as it contains 40% nourishing protein. Levels of low-glycemic carbohydrates are kept down (only 20%). The ingredients are all fresh and natural, such as fish, chicken and turkey, eggs and vegetables and you won’t find any preservatives. Ingredients are carefully listed on the packaging, so there are no nasty surprises. 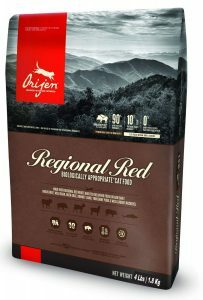 Orijen Regional Red for Cats also contains plenty of nourishing protein (40%) and like the cat & kitten food it only contains 20% low-glycemic carbohydrates. Animal protein is the key ingredients here with plenty of fresh meat included in the ingredients. Zinc is added to give this food a healthy boost. Fresh meat combines with muscle meat, organs and cartilage for an added vitamin boost and there are added veggies, fruit and botanicals too. These help to keep blood sugar on an even keel and helps to keep your pet trim – an overweight pet could equal an unhealthy pet, don’t let your pet become a fat cat! 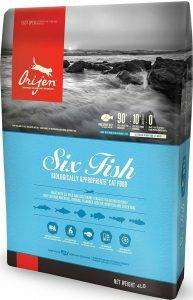 Orijen Six Fish Dry Cat Food has been designed to meet the needs of cats of all ages – from kittens through to more mature moggies in their twilight years. It’s full of protein (40% full to be precise), contains only 18% low-glycemic carbohydrate, contains plenty of nutrients, and is formulated to tickle your cat’s taste-buds. This food is very fishy – in a good way! Plenty of whole fish, along side organs and cartilage, ensure your cat gets a plenty of goodness. There are added fruits and veggies to keep blood sugar on an even keel and help your pet to maintain a healthy weight. 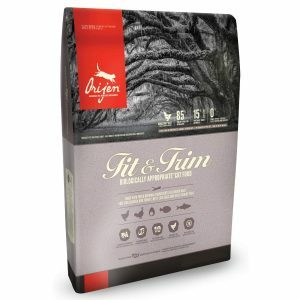 Orijen FIT & TRIM Cat Food has been specifically formulated for cats that have a tendency to pile on the pounds. If your moggy is a little on the large side this could be the perfect solution. It packs in plenty of soluble fiber and protein (44%) and contains only 16% carbohydrates. The Fit and Trim food only contains the best ingredients (no rendered poultry) and everything is fresh or raw (flash-frozen), the air-dried dehydrated poultry is a great source of protein and the addition of freeze-dried liver gives this cat food a tasty flavor. 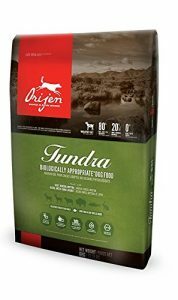 Orijen Tundra Cat Food. 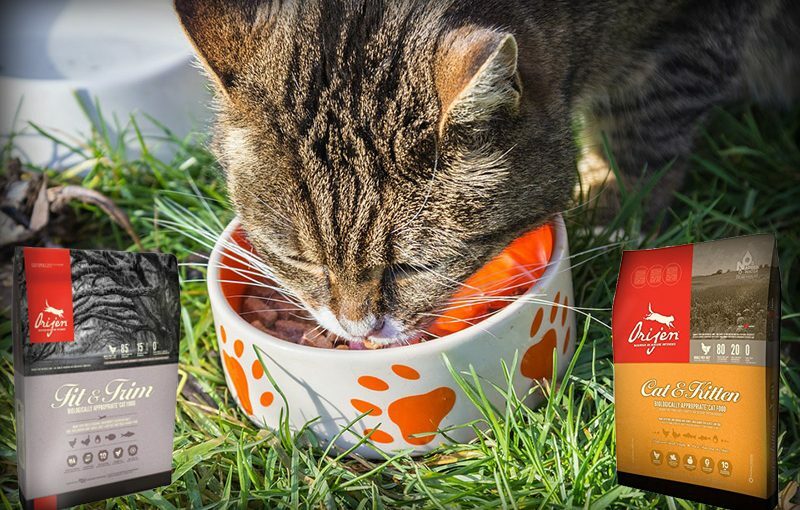 is grain free (great for cats with sensitive tums) and contains plenty of tasty ingredients such as goat, venison, mutton, bison, artic char and rabbit. It’s made up of 80% protein and 20% fruit and veg and all of the ingredients are natural. This food is great for cats of all ages and will appeal to even fussy eaters (the freeze-dried liver gives it a unique flavor your moggy will love). Choose the food that’s most appropriate to the needs of your feline friend. Think about the age of your cat (is the food appropriate for all life-stages)? Does your cat have any specific health needs? For instance, is he on the tubby side or does he have a sensitive tummy? Personal taste may also come into play – if your cat is a picky eater a well-flavoured food (such as one enhanced with liver) could encourage puss to tuck in. As a general rule look for food with natural ingredients, no artificial flavor or preservatives and that clearly shows the ingredients. Feed your feline companion well and he will be healthy, happy and enjoy a purr-fect life!